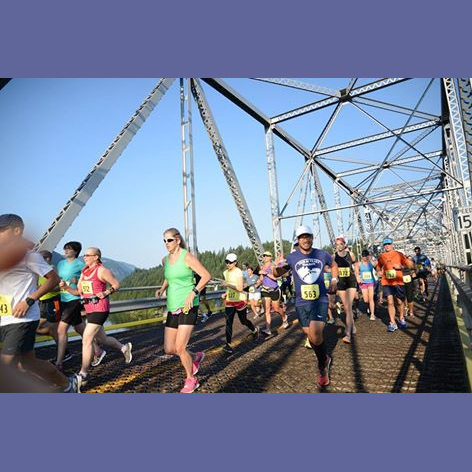 Join the Bridge of the Gods Half Marathon and 10K Run on Sunday, August 16th in Cascade Locks, OR. This Half Marathon and 10K Run crosses 4 bridges, creeks and with thick shaded canopy covering parts of this scenic pathway participants will stay cool under the hot August sun. Read details about this Bridge of the Gods Half Marathon and 10K Run below. Packet Pickup Locations. We are excited to announce three packet pickup locations for this year's Bridge of the Gods Run. Our partners The North Face and Thunder Island Brewing will be hosting packet pickups at their locations. First packet pickup will be Friday August 14th from 3-8PM at The North Face Portland location at 1202 NW Davis, Portland Oregon 97209. Second packet pickup will be on Saturday August 15th between 4-7PM at Thunder Island Brewing located at 515 NW Portage Way, Cascade Locks, Oregon. Day of race packet pickup will be in front of the Cascade Locks School between 5:30-7 AM at 300 Wa Na Pa Street, Cascade Locks, Oregon. We are less than three weeks from race day. More updates coming this week. We are so excited!